The first Nouveau Geek box is all about Super Mario. I don’t know about you but I have so many good memories of playing Super Mario when I was a teenager. Everything in this box is themed around Super Mario, including the polish names and the extras. Speaking of the extras…. 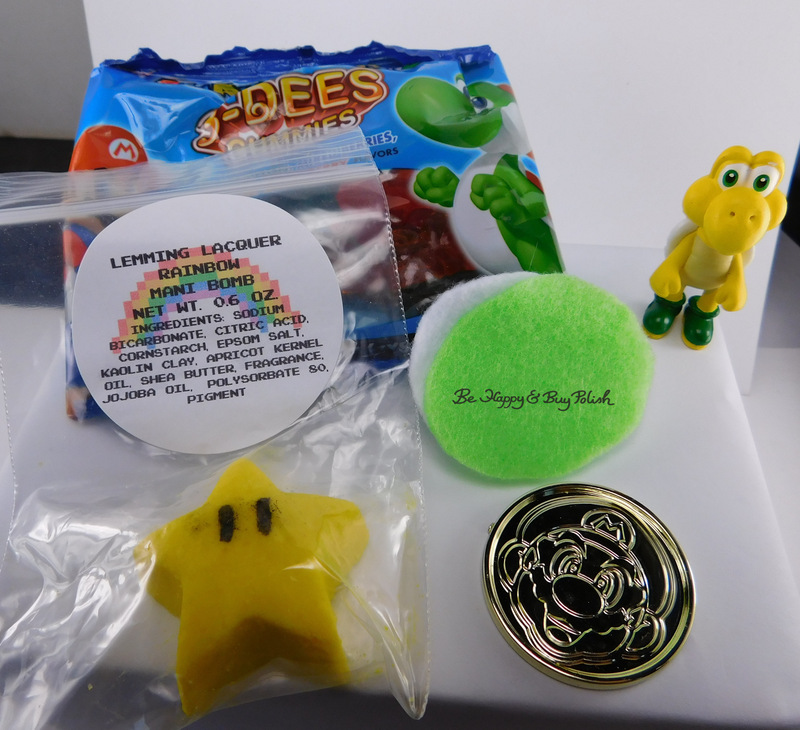 Included in the box are a package of Super Mario 3D Gummies, a star mani bomb from Lemming Lacquer, 2 felt nail polish remover pads from le polish, a Koopa turtle, and a Super Mario brothers coin. Yeah, extras on point! Now are you ready for the polishes? Check them all out after the collage! First up is Ellison’s Organics Your Princess is in Another Castle. This is a sheer pinkish shimmer polish with iridescent blue specks and gold squares. Formula was great, no problems getting the bigger squares to come out. This is 3 coats plus top coat. I wanted to see how it would look as a topper, so I used 1 coat plus top coat over Barielle ProSina Signature in Black Rose. Oh my glob, I love this! Next up is Seventy-Seven Nail Lacquer It’s-A-Me!, a red jelly polish with red and iridescent small hexes and larger iridescent hexes. This has a jelly-ish formula with a good thickness (Goldilocks, you might say). This is 2 coats plus top coat. le polish He’ll Eat Anything is next, and it’s a lime green polish with bright lime green hexes and gold and pink shimmer. Formula is a little sheer, but it also has a good thickness to it. This is 3 coats plus top coat. Lemming Lacquer Gimme a Boost & Call Me Invincible is up now, and it’s a warm purple holographic polish with blue shimmer. Great formula on this, it went on so smoothly! It does dry matte, top coat is a must. This is 2 coats plus top coat. 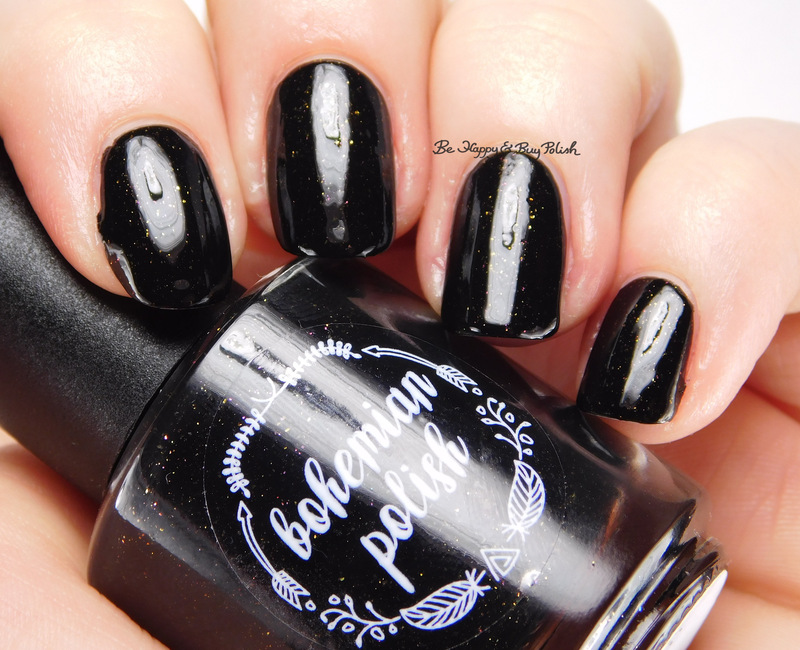 Last is Bohemian Polish bob-omb dot com, a black creme polish with gold and pink-purple small flakies. This also had such a great formula to it, but it dries matte as well. This is 2 coats plus top coat. All in all, I think this is a great box. I love that it’s themed around something geeky that brought up fun memories. I love that there is a mix of finishes and colors. You can tell that each maker involved really thought about the theme of the box and planned their polish accordingly. This is also my first experiences with Seventy Seven Nail Lacquer, le polish, and Lemming Lacquer, and I can tell you that I’m seriously impressed with them. All these makers should be on your “to watch” list! Okay, now that I’ve talked enough, let’s get down to ordering the Nouveau Geek box. Preorders start April 1 on the website. US orders are $50 shipped, international orders are $60 shipped. This is so reasonable! Let me know which of these is your favorite and because I wanna know, what’s your favorite video game? Some very lovely colors int his box. My favorite is Lemming Lacquer Gimme a Boost & Call Me Invincible.